Namekian is in an interesting position. It is indisputably powerful, yet it has only seen a modest amount of representation in top cuts. However, Namekian does benefit greatly from a metagame with a lot of Black Krillin. Namekian Crossed Guard is often overlooked, as it has so few targets. 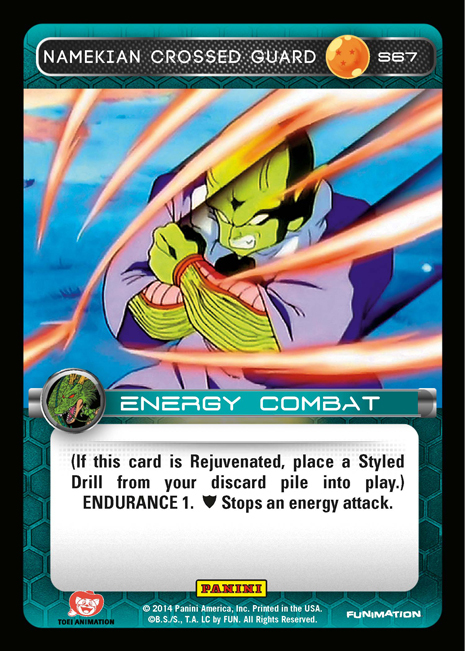 Namekian Reinforced Drill is only useful in specific builds, and it already has a mechanic to come back from the discard pile. Namekian Shocking Drill can lead to big plays, but it is also only relevant in a small subset of decks. Namekian Heritage Drill is more universally applicable, and perhaps warrants a copy in certain lists. While many of those cards have marginal effects, their value can become worthwhile when combined with Crossed Guard. Namekian Combat Drill provides the best overall effect, and it should be the primary target for Crossed Guard in most matchups. It can single handedly stymie physical beatdown decks for several turns at a time, and it guarantees you’ll have plenty of fuel in a race with another energy beatdown deck. Crossed Guard itself is unique, and effects that occur outside of combat always have the potential to be extremely powerful. Passing with cards like Namekian Knee Block and Namekian Crossed Guard (and potentially laying Dragon Balls) may force an opponent to enter into low value combats, which can be punished with cards like Namekian Hybrid Defense and Namekian Targeted Strike. In other news, the Kentucky regional this weekend is expected to reach its attendance cap – make sure you contact the store through their website or Facebook if you have inquires about attending. With so many people in attendance, you’ll definitely benefit from printing out your deck list in advance. This is sure to be the biggest DBZ event to date, so be prepared!